Only an hour from Salt Lake City, Antelope Island State Park is the perfect place to relax, enjoy nature, and witness some breathtaking views. We were heading off on a family road trip from our home in Colorado to the Pacific Northwest. Our first stop would be Salt Lake City, Utah. My daughter was excited to see the area and we were pleasantly surprised by what we discovered there. We are a family that loves the outdoors and travels on a budget, so we decided to mix up our lodging on this trip by camping at a few stops along the way. 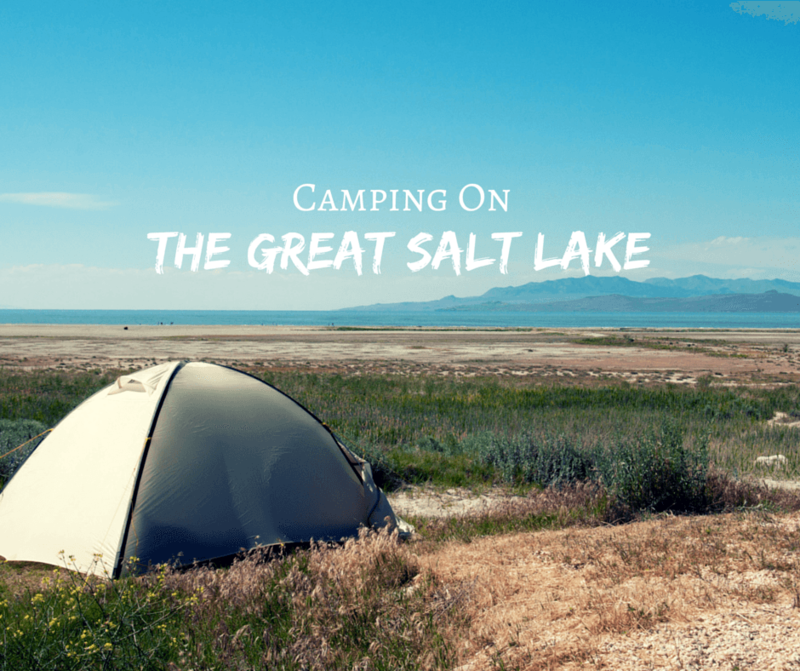 I had discovered Antelope Island State Park in my research for this trip and reserved a camp site online. This park is on an island in the Great Salt Lake and is home to wildlife including bison, antelope, deer, bighorn sheep, coyotes, and many species of birds. When we arrived, we were amazed by the unobstructed lake view and beach access from our tent site at Bridger Bay Campground. There are other campgrounds on the island, but we chose Bridger Bay for the beach access and its lack of group sites because we wanted as much privacy as we could get. There are 25 sites in this loop and even though all sites were full, it didn’t feel crowded. Each site offers a fire pit with a metal grate for cooking and a covered picnic table with restrooms centrally located to all the sites. Along the edge of the campground there are some rocks that kids enjoy climbing on and make a fantastic spot for taking in the view. Insects are the one negative aspect of camping at Antelope Island. There are “no see ums” (biting gnats), mosquitoes, and brine flies in the warmer months and although they were annoying, we felt a tent site with such amazing views was worth dealing with some bugs. We arrived on the island around 5pm on a Saturday and after setting up our tent, we headed to the beach to dip our toes in the water. The sand near the camp sites is nice and soft and feels good between your toes, but where the water has receded, the sand turns into a thin layer of crunchy rocks, so I suggest wearing shoes out to the water’s edge to save yourself some discomfort. I did not check out any of the other beaches or go out far enough to float (hi, my name is Alicia, and I can’t swim) but it’s said that due to the salt content of the water you can float very easily. We spent some time exploring the shore, admiring the beautiful views, and drawing in the sand at the water’s edge. It is almost impossible to imagine how big the Great Salt Lake is until you stand on the shore and look out at what looks like an ocean. We took some time to drive around the island to look for wildlife and were lucky to see bison near a beach with the beautiful city skyline reflecting in the water behind them as well as quite a few grazing antelope. Then we drove up to Buffalo Point to check out the amazing panoramic view from the picnic deck. When we returned to camp for dinner we saw coyotes roaming the beach in search of their dinner. Our short trip to Antelope Island State Park was capped off by an amazing sunset from our picnic table. – Make reservations ahead of time. We were planning on staying Memorial Day weekend, so the campground did fill up and we would not have been able to find a spot had we not reserved it online. Reservations are easy to make and at the time of posting were $15.00/night for a tent sight and includes the park entrance fee. Reservations can be made here. – Bring some bug spray and/or mosquito netting. The park’s website offers current insect conditions and gives good tips on what measures are most effective for each type of bug. – If you just want to visit the island and not camp, there will be a $10.00 park entrance fee that you will pay before you cross the causeway onto the island. There are some amenities at the park like food concessions and restrooms/showers at the Bridger Bay Beach day use area. Horseback riding and boat/kayak rentals are available on the island, and there are numerous hiking trails as well a historic ranch to visit. We were not able to try any of these amenities due to the short length of our stay but all information can be found on the park website. – Keep in mind that in the Salt Lake City area many businesses are closed on Sundays. We saw a few doughnut and coffee shops on our drive in Saturday night that we planned on stopping at for breakfast Sunday morning before we hit the road and were disappointed that none of them were open. If you will be visiting the area on a weekend, plan accordingly. Alicia is an amateur photographer from Colorado. She loves camping, dogs, and cake. I’ve never been camping in the Great Salt Lake but I love camping in the desert. I’ve camped in Death Valley in California so I would imagine it to be similar. It looks very serene there and I’ll probably check out the campground the next time in Salt Lake city. Thanks for sharing. I didn’t know you had a team for BTTM! Been passing thru Salt Lake City quite a lot because it is right in the path between Boise and Denver where two of our kids live. But we have never really stopped. That shot with bison on the island and the city skyline as a background is precious! Absolutely beautiful. I’ve only ever flown over the lake. I didn’t think about all the wildlife you could see. Thanks for sharing. Totally adding this to our bucket list! It looks beautiful and I love all the wild animal sightings. Thanks for all the tips to help us plan our trip and for the tip about things being closed on Sunday’s. This looks like such a pretty area to camp in, so peaceful! I love the colorful statue of the buffalo. I certainly didn’t imagine the Great Salt Lake was that big. It actually looks like the ocean in some of your photos. Great photographs, the landscape is just stunning – and that sunset at Antelope Island is just divine!